QT2256 - 640 PXI - is designed as a Combination Board Tester capable of testing highly complex and dense PCBs employing various test techniques on a single platform. 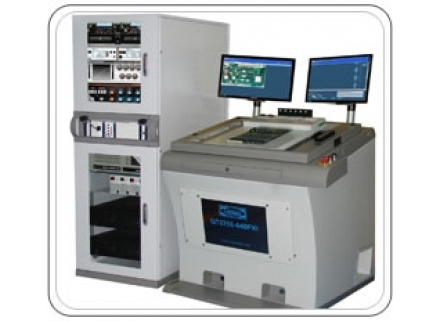 It can perform Board Level Functional Test through edge connectors of a PCB, and guided probe diagnostics utility to reliably repair Digital/Analog and Mixed Signal PCBs of various complexities for conventional PCBs. It can perform as In –Circuit Device / Cluster test by configuring Pin Drivers to High Current Pin Driver mode and interface to the UUT either through Clips / Probes or nail bed. It has in-built 20MHz 12bit Analog Driver / sensors synchronized with digital drivers for covering analog / mixed signal devices. Integrated Boundary Scan Test controller (Up to 2 Chains) and software package can be used to test today’s PCBs with high density / high pin count devices. Uses latest technology boundary Scan hardware with RAM based drivers / sensors in synchronization with Automated Test Equipment (ATE) digital and analog pin drivers. To effectively test CPU based boards without excluding the CPU from the test, the system offers optional Qmax patented Bus Cycle Signature System. In-Circuit Emulator Support for testing DSP based Board Function.Parametric Measurement Units (PMU) enables testing of the DC parametric of device pins on the edge connector for input bias current, Fan out capacity and Tri-state leakage currents to further enhance fault coverage and avoid unwanted field returns. Optional AC Parametric Tests for propagation delay, rise / fall time and pulse width measurements. The capabilities can be further enhanced with optional IEEE instrumentation or PXI based Instrumentation and control through TestDirector 6 software. Analog Highways and relay matrix modules are used in routing the test pin to external measurement IEEE or PXI Instruments of user choice. Uses Virginia Panel Test adapter Interface for highly reliable Unit Under Test (UUT) Interface Panel provides for signal pins, Power (50A each) pins and RF connectors.The ATE is interfaced to an external Host PC using a 32 bit, 33MHz PCI interface card or PCI Express. It is a modular design with upgrade options. The basic system comes with 128 Universal Pin Drivers, Software programmable for High Pin Current Pin Driver or 50 Ohms source impedance, 8 Flying channels 4 Analog channels and 5 fixed UUT power supplies. It can be easily upgraded to 320 Digital Channels and with Programmable UUT power supplies, IEEE or PXI External Instrumentation, Bus Cycle Signature System, ICE and Integrated Boundary Scan Test. • In-Circuit Test capability of Digital / Analog / Mixed Signal devices using Force Drive Pin Electronics. • Precision Measurement Units for enhanced fault coverage and reduced field returns. • DC Parametric Tests. – Measurement of Input Bias Current, Fan out and Tri-State leakage test. • AC Parametric Tests. - Measurements of Frequency, Pulse Width, Propagation delay, Rise / Fall times. Non Boundary Scan devices through virtual test pins. • Integrated PXI Instruments for RF and extended tests. • External GPIB based Instrument integration. • Test access through Clips / Probes, bed of nail fixtures, edge connectors and JATG port. and Rise / Fall time. • Test Program Migration form Different other Platform to Qmax System. • Test-Jig adopters for system self-test and calibration. • Four RF connectors direct from fixture to Instruments without switching. • VPC Mass Interconnect adapter with 16 bit fixture ID, Signal pins, Power and RF Connectors. • 5 Data formats for drive edge placement. NRZ, RZ, RO, RZ and SBC. • Automatic Fault Simulation in Simulator based Test programs. • Integrated VHDL Simulator as per IEEE standards.